There are plenty of vehicles out there that talk the talk of being a seriously tough four-wheel drive bruiser, but how many of them have the mechanicals to back it up? Take most of the high-riding people haulers sitting in your local mall parking lot and stick them on slick mountain trail with more obstacles than street lights and you might be surprised at the results. So which vehicles have the backbone you want and the ability to haul five of your best friends along for the ride? In the trial-by-fire world of serious off-roading, few vehicles have the bone-stock capabilities of Nissan’s Xterra, especially when equipped with the optional Off Road Package. Thanks to a bevy of parts both inside and out designed to take whatever you can throw at them, the Xterra Off Road stands up to serious trail abuse without being a pain to live with on a daily basis. This truck has its limitations, but the average person looking to have some trail fun on the weekends probably won’t find them. That’s thanks to the vehicle’s 9.5 inches of ground clearance and impressive angles of approach and departure. The 2009 Xterra has some seriously purposeful looks outside. With slab-sided fender flares and an ultra-wide stance, the truck has the presence to back up its off-road capabilities. The Xterra has grown in recent years in almost every direction. A larger vehicle makes tight spaces on the trail a nail-biting experience, and the stiff Bilstein shock absorbers make daily commuting a little rough. Being a larger vehicle, gas mileage on this Nissan leaves something to be desired, too. Visibility is great inside the Xterra thanks to an elevated stance, and the 4.0-liter V6 engine puts out plenty of oomph. On trail, the extra ponies and lots of low-end torque are fantastic, as is the truck’s electronic locking rear differential and super-grippy BFGoodrich tires. The whole package makes for a truck that’s difficult to get stuck in any situation. But that’s off road. Take this bruiser on the paved streets around your house, and this vehicle isn’t exactly a pleasure on every level. Those grippy tires make more than their fair share of noise, and the V-6 drinks like a fish. Still, those are sacrifices we’d have to make for any true off-roader. 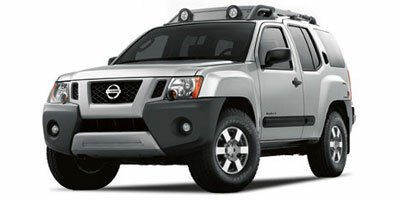 A potent 4.0-liter V-6 engine that produces 261 horsepower and 281 lb-ft of torque powers the Nissan Xterra Off Road. You can opt for a 6-speed manual transmission or a 5-speed automatic. While a two-wheel drive version is available, if we were going to suffer through the rugged ride, we would want the go-anywhere four-wheel drive system. The Xterra Off Road comes with a near-unbreakable Dana 44 rear axle when equipped with the manual transmission, and an electronically controlled two-speed differential (high and low speeds) in four-wheel drive trim. Much of this truck’s go-anywhere feel is thanks to the locking rear differential, standard in this trim level, as well as the Hill Descent and Hill Start Assist features. The diff hardware allows both wheels to turn simultaneously to provide unbeatable traction in wet, slippery or uneven conditions. The hill start assist temporarily engages the vehicle’s brake until enough forward motion is gained, keeping you from sliding backward in tight spots. 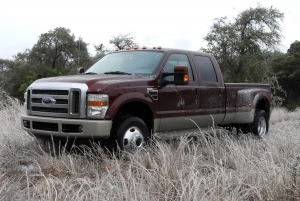 The truck also has respectable angles of approach, departure and break-over for tackling obstacles on the trail. The Nissan Xterra Off Road is available with a technology package that includes all of the goodies any self-respecting techie would want. Bluetooth hands-free calling, a kicking Rockford Fosgate sound system with a 6-disc CD changer, XM satellite radio and MP3 capability are all part of the mix. Those toys will set you back a mere $800, which is a steal in our book. This is no green machine. The sizeable V-6 engine is just as thirsty as other midsize SUVs out there, and the heavy four-wheel drive components make the engine work, and drink, that much harder. 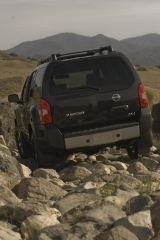 The four-wheel drive Xterra Off Road delivers 15 mpg city, 20 mpg highway as a manual and 16 mpg city as an automatic. In two-wheel drive, automatic trim, the truck gets 14 mpg city and 20 mpg highway. The Xterra’s interior is no-nonsense but well-executed, with good-looking materials everywhere you reach. The steering wheel is solid without being bulky, and while the dash utilizes plenty of plastic, it doesn’t feel cheap. The eight-way adjustable driver’s seat accommodates people of just about any size and makes the most of otherwise rigid seats. Outside, this truck wears a suit befitting its capabilities. The Xterra looks tough from just about every angle, with a sharp brushed grille up front and bulging fenders flared down each side. The super aggressive BFGoodrich tires and beefy aluminum wheels make for a look that means business. The Nissan Xterra Off Road weighs in at $28,340. While that may seem like a hefty price tag for a mid-sized SUV, the vehicle’s capabilities put it on par with serious machines like the Toyota FJ Cruiser at $23,320, the Jeep Wrangler Unlimited Ruibicon at $30,940 and the Ford Explorer Sport Track at $28,510. Remember that the technology package for the Xterra will bump the price tag up another $800, putting the final tally over $29,000. Nissan specializes in making some seriously tough vehicles. The company knows off-road thanks to a committed off-road racing program that includes participation in one of the most grueling races in existence, the Baja 1000. While the Nissan Xterra Off Road offers plenty of muscle for working your way over obstacles and through the woods, as well as plenty of cargo space inside for friends and all of your gear, the truck is a little rough around the edges, in a good way. Since its release in 2000, the Xterra has proved to be the SUV for those that actually spend as much time off the road as on it.